Snorkeling Kahe Point Beach Park is interesting and also a popular diving spot. Tracks Beach just north has some snorkeling too. These beaches are exposed and can have challenging entrances due to waves and currents, so we don't recommend them for beginners. For the strong swimmer with some wave-sense, going out in some small waves at Kahe Point is still okay because it is often calmer a short distance out from the beach. For the beginner or not strong swimmer, there are some snorkeling boat tours from Ko Olina Marina that make the water entrance easier and the swim shorter. This place is known by many names. 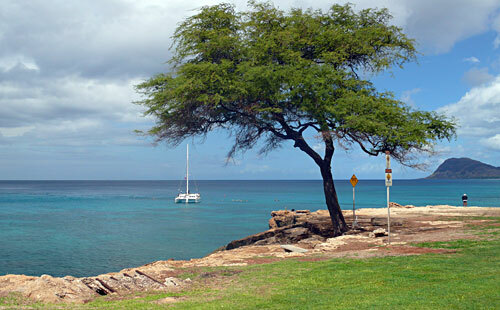 Kahe Point is the most southern small beach here. There is another beach access point a little to the north next to the road and some railroad tracks, called Hawaiian Electric Beach Park or Tracks Beach. 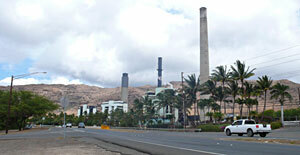 Often the whole area is called Electric Beach because of the big electric plant across the road. 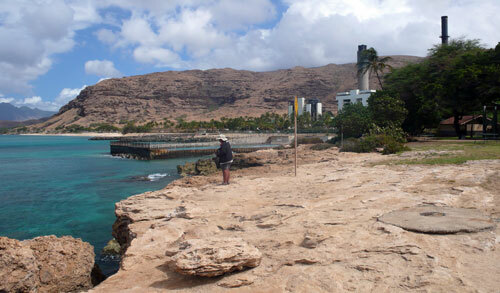 It is this electric plant that makes snorkeling Kahe Point interesting. The plant uses seawater as a coolant, and then recycles this water through a big tube out into the ocean. And this recycled water is pretty warm. That constant flow of warm water has attracted a lot of sea life that flourishes here. 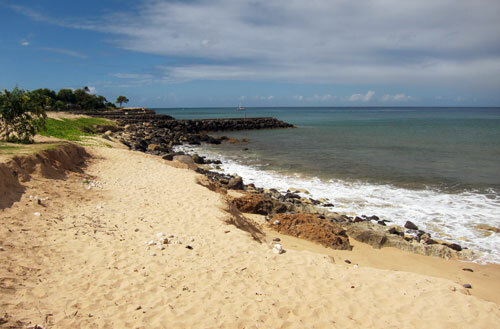 We found the best snorkeling to be from the beach at Kahe Point Park compared to the Hawaiian Electric Beach Park in front of the tracks, but you can snorkel both. It is best to follow the driving directions below and park near the beach you will be snorkeling from. Don't leave any valuables in your car or on the beach when snorkeling Kahe Point or Tracks Beach. To get to the beach for snorkeling Kahe Point, walk north from the parking lot and down the hill past the pavilion, restrooms and through the trees. This steep little beach, that has a cement wall along the whole north side of it (see picture below), is where you enter. Sometimes it gets too wavy to get in here and if it is, do not attempt it. Come back when it is calm. Summer tends to be the calmest time. Even if you determine that it is calm enough for you, watch for waves and time both your entry and your exit with them. For snorkeling Kahe Point, you should be able to enter in bare feet with your fins in your hands, but there are rocks and some reef not too far out, so start swimming soon. If you are more comfortable, wear some water shoes or flip flops. Slip on your fins when you've reached sufficient depth and the waves are calm enough. The water entrance further north for snorkeling Electric Beach or Tracks is in front of the beach backed by the lava rock wall, past the end of the chain-link fence (see driving directions). Though this is a beach entrance (see picture below), it can be tricky too. There are a lot of currents here, it can be wavy and the reef and rocks start really close to the beach, so this is not for beginners. There is more sand in the entrance if you walk a little to the north. You should be able to enter in bare feet, but get your fins on and start swimming right away. You might find it useful to have footwear for this entrance, too. For snorkeling Kahe Point, before walking down to the beach, look over the area by walking out to the edge of the bluff in front of the parking lot first (see picture below). 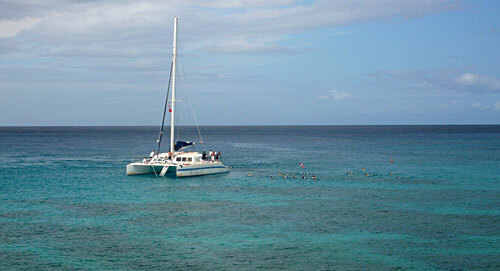 The most interesting snorkeling here is a long swim straight out from the beach. Look for a disturbance in the water. It should look like it is boiling. That is the warm water coming up from the tube, (and no, it is not boiling hot, it is just warm). That is where you want to swim out to. The other good snorkeling area here is all along the rocks in front of the bluff you are standing on. The first snorkeling Kahe Point area is out to the end of the tube. The tube begins in the pool contained by the cement wall, so swim straight out from the beach, using the line of the wall as your reference for about 500 feet. On the ocean floor to the right you should find a rocky pile that heads straight out. That pile of rocks is what is covering the warm water tube. Follow it until you reach the end where the water comes out. You will likely see fish and some corals along the rocks and reef on the way out, but the visibility may not be great, especially near the beach. 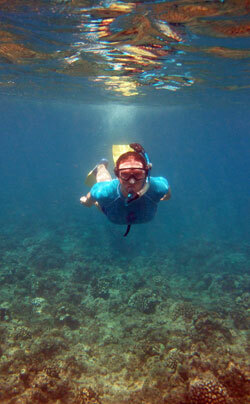 The depths for snorkeling Kahe Point are between 6 feet near the beach and 30 feet at the tube exit. Once you reach the end of the tube where the water comes out, the water is noticeably warmer and there is lots of sea life with very good visibility. The end of the tube is encased in cement and this has life on and around it. This can be a good place to just hang out and see what swims by. It is recommended that you do not try to enter the stream of water leaving the tubes, because it is very turbulent. The second area for snorkeling Kahe Point Beach is to the left side of the beach around the rocky cliffs you looked over. 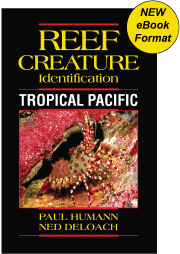 The reef extends out about 250 feet from the shoreline and then drops off to sand. You can swim along this as far as you deem safe depending on currents and your swim back to the beach. Be sure to watch out for people fishing from cliffs above you here. 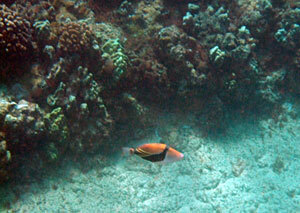 This reef has some fish to see and some healthy corals in the mostly rocky reef. It ranges in depth from about 6 feet near the beach to 20-25 feet where the reef drops off to sand. The visibility is usually pretty good and better away from the beach. Compared to Kahe Point, snorkeling Electric Beach or Tracks is not really as interesting. In our experience, there were not nearly as many fish and the visibility was not as good. But if you want to snorkel it, you are likely to see something. The reef you want to explore is directly in front of the beach that is backed by the lava rock wall. 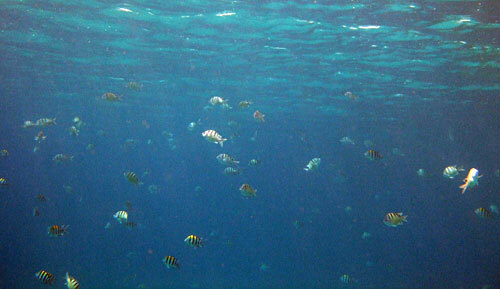 It has some patches of live coral and a few fish to swim with. Do not head south of the jetty on the south end of the beach as that is where the electric plant pulls in the sea water it uses to cool. The reef drops off to sand about 400 feet offshore. The depths range from a few feet near shore to about 15 feet where the reef drops off. Again, watch for currents here and be very cautious with waves on your entry and exit. Traveling To Maui Or Kauai Too? 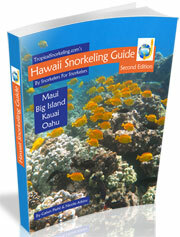 If you will be snorkeling on Oahu and any of the neighbor islands, you will find our Hawaii Snorkeling Guide eBook useful in planning your adventures. 1. Get on Kalakaua Avenue (the one way beach-front main drag). You will be heading southeast. 2. Turn left on Kapahulu Avenue and keep on it and you will go under H-1. 3. 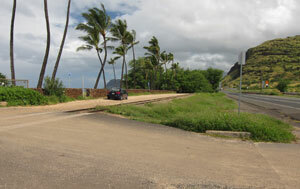 Veer to the left on Waialae Avenue and shortly on the right you will see an on ramp for H-1 West. Take it. 4. You will follow H-1 as far as it goes to the west. On it, you may take the shortcut on H-201 if you desire. You will pass through Pearl City and Waipahu and Kapolei just before the highway changes to Hwy 93 (Farrington Hwy). 5. Follow Hwy 93 until you come to the water. There are signs for Kahe Point Beach Park, where you will turn left into the first parking lot on the beach side of the road before you reach the electric plant. 6. For Hawaiian Electric Beach Park, keep driving on Hwy 93 and as you pass in front of the electric plant, watch on the left side of the road for the tiny paved road near the end of the chain-link fence where you can drive over the railroad tracks. 7. The access to Hawaiian Electric Beach Park is across the tracks and just to the right of the end of the fence in front of the lava rock wall, where you park. 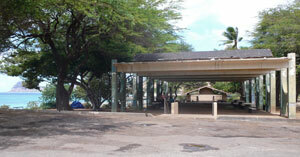 At Kahe Point Beach Park there are restrooms or port-a-potties available, though they are usually yucky. You will also find drinking water, picnic tables, showers, BBQ pits, and a pavilion and trees for shade. At Electric Beach (Tracks) there are picnic tables and some tree shade.